Thanks for checking and solving this issue. Hi. I am unable to download the files due to a server error. It says that a ticket is not provided. Please help asap. Thanks. Please contact Code Project for this error (if it's not a local error): you can ask what's causing this error and what to do about it at 'Bugs and Suggestions' under the 'Help' tab at the top of the page. Is possible to embed a masked image (ex: PNG) overlay with antialiasing? Re: Is possible to embed a masked image (ex: PNG) overlay with antialiasing? There's something in the image that makes the background color (the red transparency color of the overlay form) show through. You have to remove 'everything' that's outside the thumb circle in the image or make it the same color as the overlay's transparency (background) color. If you can post the original image (without the overlay) I can see what colors are in the image (because the red border is a bit 'strange') and make an example 'fix' for you. There's a sort of shadow border (anti-alias effect) around the circle in the image that's causing the problems. Anti-aliasing on a transparent surface (the overlay) always gives this sort of problems because it's not really anti-aliasing with the true background (the underlying movie) but with the background color of the overlay (in your case the red color). You have to remove the shadow border from the image or adjust the background color of the overlay form to reduce the visibility of the border. The latter won't be easy with this image because the anti-alias area is big (but might work better with text - as in the example application's message overlay). P.S. In this case you can reduce the anti-alias effect by changing the background color of the overlay to black. I am playing a video from a DVD VOB file. When it plays I am getting no sound output. Also, when playing an MP3, the sound does work. What codecs are you using (e.g K-Lite)? Can I download this (or a similar) file somewhere for testing? Do other players produce sound when playing this file? Yes, other media players play the VOB. i.e. Windows Media Player, I double click the VOB file and voila, it plays the video with the sound. If you look on a DVD under Video_TS, there are several VOB files, they are basically "chapters" within the video. You can usually play any VOB,even if it is not the first and they will play. I believe the codec is MPEG-2. I don't have many DVD's but I found one with a concert of Katie Melua (sorry about that ). The PVS library plays the video (.VOB) with sound from the DVD. If I copy just a VOB file (no other files) to my harddisk, it also plays the video with sound. I saw (Google) that the missing DVD sound is also a problem for others (with different software). I will continue looking for a solution (it's probably found with some codec settings). Please try and google something like 'no sound with VOB' and see if you maybe can find a solution too. UNcheck the option for "Use ffdshow only in"
Please also try the latest codecs (from K-Lite codec pack or other). I think your problem is caused by a missing, defective or wrongly configured audio codec. You can google with 'check if codec missing' and check out the first few results. In order to help you to search for a solution, download one of the programs that can check which codec a file requires and whether it is present on the computer. And maybe reinstall the codecs used on your computer, etc. Good luck! Please let us know if you find a solution (for users with the same problem). Thanks for the continued pursuit of a solution. I downloaded and installed a program called MediaInfo, which allows one to view the details of a media file. Keep in mind the video and audio both play well using Windows Media Player, which as I understand it has a limited Codec base, but it does play with the installed codecs on my machine. I hope you can see something that might help. The VOB video and audio should play well on any computer with the K-Lite codec pack installed. I'm afraid you have to google for a solution as I can't see any problems with the info of the VOB files you listed. Can I download this file somewhere to check it on my computer? It might be that your system (codecs) can't play the 448 kb/s audio or having problems with the 6 channels (Dolby 5.1?). My tested VOB files have lower audio bitrate and only 2 channels (see below). Perhaps the best solution (for now) is to convert the file to another format, e.g. mp4, or try to lower the audio bitrate/channels or have a look at the codec's audio settings. Hey Peter. I started a new discussion. Hope, this is ok so?! Anyway...I´ve tested the skip function in a small test project too. Only with 2 buttons "play" and "skip": it works! In my main project the skip function works too as long as I insert a trackbar slider. Only when there is a slider the skip function doesn´t work. Yes, good place to start Dictation 2.0! And yes, you found a bug! 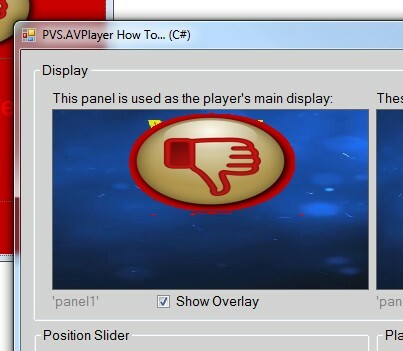 The slider position is set below the minimum value (zero) and throws an exception (crash). I'm gonna fix that today. Thank you Sandro for the bug report! Your test code works. The program don´t crash with your lines from above. I don´t need this update today....take your time. Can I use a slider with a command button too, instead of a trackbar? I don't know exactly what you mean by using a slider with a command button (but if you want to change the playback position you can use one of the position commands). Do you think I should post a new update in the next few days, or is that too soon? An update in the next few days would be nice. You fixed the trackbar problem by using the skip-function only by rewind skip or by forward skip too? Oh, I see. Yes you can (and just a reminder: there's also a shuttle slider). How can I realize that the player don´t stop at the end of a track? Instead the player should turn into pause-mode. Thanks! Hope the slider works well now and thanks for reporting the problem. When media has come to the 'end of the track', there's nothing more to play so you can't pause at that moment: playing has finished. But perhaps we can find a solution for your 'problem' if you tell me what it is that you want to do. yes thanks. The slider works just like it should. I think it is a little bit inaccurate. With the sub from above my program shows also the time from end. The time counts backwards while the player is playing a track, respectively a dication. How can I display the whole duration-time of a track without counting backwards? I haven´t found any solution.